Heirloom-inspired, this gleaming Gorjana pendant necklace is both timeless and trendy. 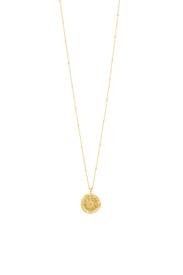 18K gold plated necklace with coin pendant detailing. Lobster clasp closure. 19" long.